I am a bit obsessed with notebooks and journals (I even have a Pinterest board devoted to the topic). As tech-savvy as I am, I still find there is no comparison to jotting down notes by hand in the Moleskines that are always with me. 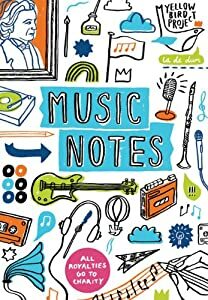 In August, the Yellow Bird Project is partnering with Chronicle Books to publish Music Notes: A Journal, a notebook where half the pages feature music staffs and the others have space for notes. As with all Yellow Bird Project endeavors, their royalties will go to a worthy charitable cause. For a chance at winning this notebook and a $100 Threadless gift certificate, leave a comment with the place you are most likely to jot down notes (a notebook, phone, iPad, napkin, laptop, etc.). The winner will be chosen randomly at midnight ET Friday evening (June 28th).